In the lavish court of the Sun King, Louis XIV of France, elaborate social activity revolved around... chairs. Three kinds of chairs: chairs with arms, chairs without arms, and backless three-legged chairs called tabouret. When ladies gathered in a room, a countess could sit in the armchair while a marchioness (wife of a Marquis) had to sit on the chair without arms and a baroness sat on the backless stool. But, if a duchess -- who outranked the others -- came into the room, then the duchess got the armchair and bumped the other ladies down a notch. No person of lesser rank could sit in the presence of a person of higher rank unless the higher was properly seated first -- and that left the lowly baroness standing. First stood the King. Then came the crown prince or Dauphin, followed by Monsieur, a title given to the King's brothers. Then came dukes, counts, marquises, and then barons all in a line of descending rank. Great problems resulted. For one thing the title and rank went with a property -- not with a person. That meant that if you owned a duchy, you were automatically a duke. But, if for any reason you lost the land, you lost the position. That's why the territory often was named in the title: the duke of such-and such, the count of someplace. The scramble for preeminence, prestige and position generated intrigues, duels, pain and life-long hatreds as every man and woman at the court fought to have others acknowledge their own prominence. In his palace at Versailles, Louis XIV regularly entertained as many as 10,000 dukes and duchesses, counts and countesses, marquises and marchionesses, nobles, bishops, priests, monks, abbots, soldiers, courtesans, ambassadors, guests -- and their servants, who each ranked above or below, other servants according to the positions of the employer. Every one of these people wanted something from the king. And whatever each one wanted had to be gained at the expense of someone else. The king played all these people off against each other in ploys of elaborately organized chaos. King Louis XIV believed in the divine right of kings. He felt he stood as God's appointed ruler and that all persons and property in France belonged to him to dispose of as he pleased. Louis knew that money in one pocket is not in another pocket. If it is not in my pocket, it is in yours; and if I want it in mine, it has to come out of yours first. You know that too and fight to keep your own. The King also believed that the moral laws incumbent on ordinary men were not binding on him. This belief often expressed itself in lascivious sexual behavior. The king felt any husband ought to feel proud if his wife or daughter had been of service to the monarch. The extent a woman pleased -- or failed to please -- the taste of the king often determined the status, wealth and position of her self and her family. It even determined which chair she could take in the crowd. Once, when a girl who sold chickens caught the king's fancy, she moved to the head of the line. The duchesses and countesses seethed. Men achieved rank for no more noble reasons. Public officials, nobles, army generals -- even pastors, bishops and archbishops -- were appointed, or removed, at the whim of the king for whatever reason appealed to him. A few daring people cut across this elaborate nonsense. A handful of devout Christians lived in this decadent French court. And most noteworthy among these was Madame Jeanne Marie Bouvieres de la Mothe Guyon. The queen of England had been a guest at the estate of Jeanne Marie's father, when Madame Guyon was a little girl. The queen was so taken with the child's beauty that she wanted her as a maiden in her own court but the father, Seigneur de la Mothe Vergonville, a lord and a millionaire, kept his daughter for France. The little girl spent most of her youth in various convents being raised by nuns. When she was age 16, her father married her to the 38-year-old M. Jacques Guyon, a high ranking nobleman with vast wealth. The couple lived in one of M. Guyon's townhouses in Paris where they enjoyed the glitter and glamour of the city and the court. She gave birth to several healthy children. Yet, although she was noted for her beauty and had wealth, position, estates, carriages, gowns, children and a handsome husband who loved her, and although she had been raised in a religious atmosphere and she was sensitive to spiritual things and supported numerous charities -- even with all that, still the young woman felt a deep hunger, a yearning, a longing for something more. Something vital was missing from her life. A visiting Franciscan brother told her, "Your efforts have been unsuccessful, Madame, because you have sought without, what you can only find within. Accustom yourself to seek God in your heart, and you will not fail to find him." "I slept not at all that night because of thy love, O my God, flowed in me like delicious oil, and burned as a fire which was going to destroy all that was left of self in an instant." Although she was only 20 years old when she discovered Christ in her heart, these words characterize the tone of her whole life from that point on with little fluctuation. A burning, almost mystical awareness of the love of Christ, permeates all that she experienced. In court, in the business world, in prison, in church, the love of Christ pre-occupied Madame Guyon whatever else might be happening around her. She devoted herself to intense prayers of adoration and to charitable works: founding hospitals, giving scholarships, building churches, funding monasteries and convents, caring for individuals poor families. Her giving to the poor became so extensive that she had to hire a steward to disperse gifts anonymously -- but at the same time she often washed infected sores and soldier's wounds with her own hands. Her parents died leaving her a title and a fortune of her own. Two of her children also died. Then in 1676, her husband died after a lengthy illness leaving the 28-year-old widow with incredible wealth and vast estates to manage. For a time she considered becoming a nun, entering a convent or going to China as a missionary, but she realized that huge numbers of people depended on her employing them on her various estates for their only income to support their families. She felt that managing these estates was a God appointed responsibility though she preferred to devote herself to prayers of adoration. Among the problems her husband left when he died was a decision on a complicated lawsuit which involved 22 different claimants and their lawyers trying to divide income from one estate. They all had appealed to him for urgent judgment and the decision about the settlement fell on the young widow's shoulders. She prayed for divine guidance in the business. "I shut myself up in my closet about thirty days, not going out at all except to my meals and to religious worship," she said. "I at length completed the examination, formed my opinion upon the subject, and drew it up in writing. The parties were summoned together; and without reading it or knowing what my decision was, they accepted it and signed it. I afterwards learned that they were so well pleased with what I had done, that they not only commended it much, but published it abroad everywhere. The hand of the Lord was in it. It was God who gave me wisdom". "I henceforth take Jesus Christ to be mine. I promise to receive Him as a husband to me. And I give myself to Him, unworthy though I am, to be His spouse. I ask of Him, in this marriage of spirit with spirit, that I may be of the same mind with Him -- meek, pure, nothing in myself, and united in God's will. And, pledged as I am to be His, I accept as part of my marriage portion, the temptations and sorrows, the crosses and the contempt which fell to Him. --- Jeanne M.B. de la Mothe Guyon, Sealed with her ring." This document contains several key clauses which show up again and again in her life: being of the same mind with Christ, being meek and pure, being nothing in herself, being united in God's will, bearing crosses and contempt. Madame Guyon became noted as a leading figure in a Christian movement called Quiteism. Essentially, she recognized that God is all; nothing else counts. She felt so identified with his will and his love that no lesser thing deserved her attention. A person in love thinks about the beloved all the time, no matter what else is going on. An extreme example: Once when traveling with a party of other lords and ladies by carriage near a flooding river, the bank caved in sweeping the road away. The carriage overturned in the flood and began sinking. Drowning horses screamed kicking and struggling in the water. Footmen, coachmen, lords and ladies scrambled for safety. "Others threw themselves out of the carriage in excessive fright," she said. "But I found my thoughts so much taken up with God, that I had no distinct sense of the danger to which we were really exposed. God, to whom my mind was inwardly drawn, delivered me from the perils to which we were exposed, with scarcely a thought on my part of avoiding them... In this state of mind, I can not fail to be content in the trials which He sees fit to send upon me. In the spirit of acquiescence in God's will, I would rather endure them all my life long, than put an end to them in a dependence on myself." Would almighty God get upset and panic over a minor incident like a traffic accident, she reasoned? Then why should a person attuned to his mind and will be concerned? She had something more important to think about than a carriage accident: her adoration of the Living Christ. "But the misfortune is that people wish to direct God instead of resigning themselves to be directed by Him. We wish to take the lead, and to follow in a way of their own selection instead of submissively and passively following where God sees fit to conduct them. And hence it is, that many souls who are called to the enjoyment of God himself and mot merely to the gifts of God, spend all their lives in pursuing and in feeding on little consolations," she said. In July, 1681, she and her maid, who was her best-friend and a like-minded Quietist, took her five-year-old daughter and left Paris for a missionary trip near the protestant stronghold of Geneva. King Louis XIV had sent troops into the area to kill or convert the heretics. Madame Guyon felt that Protestants and Catholics alike devoted too much energy to observing hollow forms of religion while neglecting internal purity and truth. As part of her mission she endowed convents, established schools, founded hospitals, and served in soup kitchens. But by far the most impact from her missionary work came from her personal witnessing. "It had the look of the greatest poverty and had no chimney except in the kitchen through which one was obliged to pass to go to the chamber. I gave up the largest chamber to my daughter and maid. The chamber reserved to my self was a very small one and I ascended to it by a ladder. Having no furniture of my own except some beds, quite plain and homely, I bought a few cheap chairs and such articles of earthen or wooden ware as were necessary. Never did I enjoy a greater content than in this hovel. It seemed to me entirely conformable to the littleness and simplicity which characterize the true life in Christ". Madam Guyon made no announcement of her presence in town but within days a steady stream of people began to call at her door seeking spiritual help. Milkmaids and knights, bishops and drunks, streetwalkers and nuns, monks and merchants -- all felt strangely moved to seek the prayers and counsel of this quiet woman who kept to her own house praying. The line formed at dawn and the last visitor seldom left before midnight. Some turned to Christ; some left to throw rocks at her windows. She prayed with all. "People flocked together from all sides, far and near", she said. "Friars, priests, men of the world, maids, wives, widows, all came, one after another to hear... Many were the souls which submitted to God at this time." Some priests, "Were grievously chagrined that a woman should be so much flocked to and sought after. For, looking at the things as they were in themselves, and not as they were in God, who uses what instrument He pleases, they forgot, in their contempt for the instrument, to admire the goodness and grace manifested through it." During the years of her missionary trips, she also wrote several books including a 20 volume commentary on the Bible and A Short Method of Prayer. Her book on prayer emphasized the importance of internal spiritual life over mere external forms of religion. "It is not actions in themselves considered which please Him, but the inward spirit with which they are done; and especially the constant ready obedience to every discovery of His will, even in the minutest things," she said. "It was my object to instruct them in the way of living by simple faith, in distinction from living ceremonially; and thus to lead them to rest upon God alone through Christ. I remarked to them, that the way of living by faith was much more glorious to God, and much more advantageous to the soul, than any other method of living," she said. This stand on faith got her into serious trouble. Persecutions abounded. People burned her books. Some said she was insane. Everyone held an opinion; they loved or hated her, they praised or condemned. She ignored them all equally as she sailed serenely on following what she believed to be God's will. God's will led her to return to Paris. 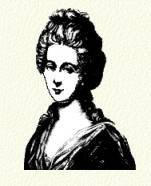 Trouble for Madame Guyon appeared to come from several sources -- yet, she said it only came from one source. The several sources included relatives who hoped to eliminate her so they could control the Guyon fortune. Her purity of life offended some of the ladies of the court who saw her simple lifestyle and piety as a rebuke to their own licentiousness. Some protestants viewed her missionary efforts as a papist plot meddling in their religious freedom. Some catholic archbishops said she was a living saint while others condemned her as a heretic. King Louis XIV wanted Madame Guyon to give her 12-year-old daughter in marriage to the Marquis of Chanvalon, an old rake to whom the king owed money; the girl's estates would pay off the King's debt. For whatever reason, Madame Guyon was arrested and locked in prison. The king signed the letire de cachet on January 29, 1688. "Amid the various trials and temptations to which I was exposed," she said, "I bore everything with the greatest tranquility, without taking any care to justify or defend myself. Having faith in God, I left it with Him to order everything as He should see best in regard to me." In prison she prayed: "O my God, let me be wholly thine! Let me love thee purely for thyself, for thou art infinitely lovely. O my God, be thou my all. Let everything else be as nothing to me." The reason she could enjoy tranquility and concentrate on her devotions even while separated from her daughter, her wealth and her freedom was that she believed all her troubles issued from only one single source-- the love of God. She said of her persecutors: "They only did what God permitted them to do, which enabled me always to keep God in sight... When we suffer, we should always remember that God inflicts the blow. Wicked men, it is true, are not infrequently His instruments; and the fact does not diminish, but simply develops their wickedness. But when we are so mentally disposed that we love the strokes we suffer, regarding them as coming from God, and as expressions of what He sees best for us, we are then in the proper state to look forgivingly and kindly upon the subordinate instrument which He permits to smite us." Not only did she see God as the source of every Christian's troubles, she also saw him as the source of every comfort. When she fell gravely ill in prison, to the point of dying, her jailers called in a physician, an action she saw as another evidence of God's love: "It was God who put it into their hearts and gave them the determination to do it... After bringing me down, He was pleased to raise me up again," she said. The king promised to release her from prison in eight days if she would consent to her daughter's marriage to his crony. She refused. "God allows suffering, but never allows wrong," she replied. "I see clearly that it is His will that I should remain in prison and endure the pains which are connected with it; and I am entirely content that it should be so. I can never buy my liberty at the expense of sacrificing my daughter". "When God was pleased to call me to Christ's mission, which is a mission of peace and love to the sinful and the wandering, He taught me that I must be willing to be, in some sense, a partaker in Christ's sufferings," she said. It looked then as though she would stay locked up for the rest of her life. Louis XIV did not take kindly to anyone, even members of the highest aristocracy, who opposed his will. Whatever the pampered king thought, God must have wanted Madame Guyon out of jail. Her case had become somewhat of a novelty; seeing a highborn lady, a millionaire heiress who owned vast estates, in jail became a spectator sport for members of the court. Lord and Ladies flocked to see her in jail. One of the tourists was Madame Francoise Maintenon. This young woman knew the ropes at court. The king kept a series of mistresses upon whom he fathered numerous children. The mistresses played fun and games but someone had to watch the children. Miss Maintenon became governess of the king's unofficial children. From that position, she undermined the other women and moved to the King's bedroom where she eliminated the competition. The king doted on her. Eventually, when the queen died years later, Madame Maintenon would become his second wife. But, when Madame Maintenon saw Madame Guyon in prison, something about the prisoner attracted the courtesan. This woman appeared to have an inner peace, an indefinable Something which was missing from the whirl of court parties, affairs and intrigues. Writing to a friend, the king's favorite mistress said, "I have been young and beautiful, have had a high relish of pleasure, and been the universal object of love... I have at last risen to favor; but I protest to you, my dear, that every one of these conditions leaves in the mind a dismal vacuity." The mistress determined to free the prisoner. She explained the law of supply and demand to the raunchy king and he soon release Madame Guyon. The younger woman invited Madame Guyon to live with her in the palace the king supplied. There Madame Guyon conducted home prayer meetings and counseling sessions for the young women of King Louis' court! Palace or prison made no difference to Madame Guyon so absorbed was she in the love of Christ. "Viewed in relation to the creature, everything is dark -- viewed in relation to God, everything is light," she said. "All that I know is that God is infinitely holy, righteous and happy; that all goodness is in Him; and that, as to myself, I am a mere nothing. For these sentiments, her enemies accused her of being a pantheist. They subjected her books, her letters, her life to close scrutinization by committee after committee. Eventually, Madame Maintenon's heart changed and she too joined the ranks of Madame Guyon's enemies. Having lost the protection of the King's favorite mistress, Madame Guyon was arrested again for heresy and locked in the Bastille. The famous Man in the Iron Mask, thought by many to be the king's twin brother, was confined in the Bastille at the same time she was there. The Bastille held the reputation of being the most horrible prison on earth. There Madame Guyon spent four years in solitary confinement. "I, being in the Bastille, said to Thee, O my God, If thou art pleased to render me a spectacle to men and angels, thy holy will be done! All I ask is that thou wilt be with and save those who love thee," she prayed. When she finally got out, as a condition of her release, the king forced her to sign a written vow that she would never reveal what had happened to her inside the awful dungeons. The flight, the freedom of my soul. The joy, the freedom of the mind.